A simple fold out map tells us all where to go, but for Amelia Coward this ordinary travel accessory has turned her Faversham-based company into an online business success. From working at her kitchen table making cards to employing 17 staff in a converted oast house just outside Faversham, Amelia switched the focus of our production when she stumbled across an old box of Ordnance Survey maps. Since then, Amelia's company Bombus (latin for Bumblebee) has been working with maps, including them in their gift designs and spcialising in personalised products. They are now taking orders from as far afield in the USA and Australia. On any working day, our studio is a hive of activity with her staff handmaking their impressive range of gifts, accessories and contemporary artworks. Their service is bespoke and their most requested map location is the Maldives, the popular wedding destination, followed closely by Las Vegas, Mauritius, New York and London. Pretty much any map location can be featured as a quirky piece of map heart, notebook, ox and all sorts of decorative pieces. Their current best seller is a heart shaped map, complete with hand finished wooden frame. The customer simply chooses a location, then Bombus source the appropriate map from their vintage collection. 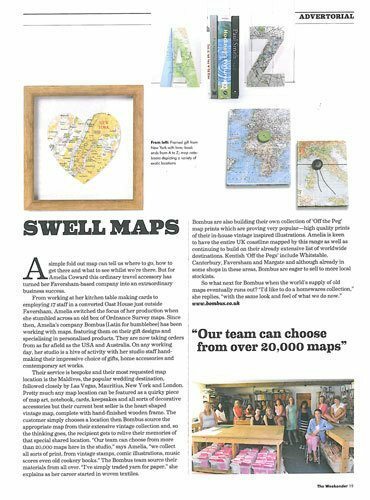 'Our team can choose from over 20,000 maps here in the studio' says Amelia, 'we collect all sorts of prints, from vintage stamps, illustrations, music scripts, even old cookery books.' The Bombus team source their materials from all over. 'I've simply traded yarn for paper.' She explains as her career started in textiles. Bombus are also building their own collection of 'Off the Peg' map prints which are proving very popular - high quality prints of their vintage inspired lillustrations. Amelia is keen to have the entire UK coastline mapped by this range as well as continuing to build on their already extensive list of worldwide destinations. Kentish 'Off the Pegs' include Whitstable, Canterbury, Faversham and Margate and although already in many shops in these areas, Bombus are keen to sell to more local stockists. So what next for Bombus when the world's supply of old maps eventually runs out? 'I'd like to do a homeware collection' she replies, 'with the same look and feel of what we do now'.